From improving driver safety to traffic congestion to freight challenges, cities and states across North America seek out HERE to find solutions to improve quality of life for increasing populations. This eGuide showcases five projects where HERE has directly supported transport departments in their work to improve quality of life for their people - from making one of the most challenging highways in North America safer for drivers to helping people travel on a Chicago Cubs game night to reducing congestion as cities attract newcomers. 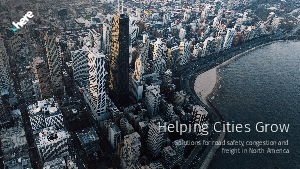 As the world’s leading location platform in 2018 (Source: Ovum and Counterpoint Research annual indexes) HERE is a trusted advisor with a range of proven solutions to keep cities moving as they grow.